"This is a simple yet different breakfast recipe. It is great for company." Place sausage in a large, deep skillet. Cook over medium high heat until evenly brown. Drain, crumble and set aside. Preheat oven to 375 degrees F (190 degrees C). Brown sausage and drain. Separate crescent roll dough into 8 triangles. Place in an ungreased 12 inch pizza pan with points toward the center. Press together to form a crust. Bottom of crust should be sealed and outside edge should be slightly raised. Spoon sausage over crust. 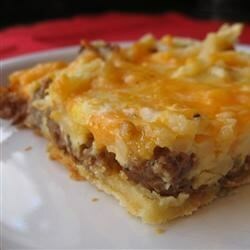 Sprinkle with hash browns and top with cheddar cheese. Beat together eggs, milk, salt and pepper; pour over crust. Sprinkle with parmesan cheese. Bake in preheated oven until eggs are set, about 25 to 30 minutes. Combine two classic favorites - breakfast and pizza - for a new morning favorite! this was a disaster. Egg oozed all over my oven. The potatoes were soggy. The cheese ended up greasy. DON'T make this as directed! Tasted good, but I used a pizza stone from Pampered Chef, and the egg ran everywhere and dried up at the bottom of my oven. I recommend a pizza pan with sides for this.